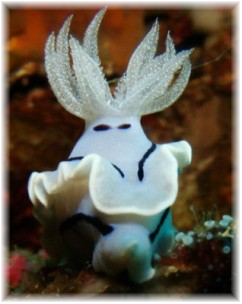 Anilao, in Mabini (Batangas), is know as one of the richest macro dive destinations in the Asia/Pacific. Because it is only a 2-3 hours drive south from Metro Manila, it has been known for years as a choice weekend getaway spot by local Manila-based divers. The area is one of the Philippines most under-rated and under-explored locations by foreign holiday divers. What the locals know is that Anilao is a treasure trove of world-class diving and incredible macro photography opportunities. The coastline has some of the highest concentration of diverse marine life on the planet, including over 90% of the coral species on the planet and a staggering number of different species of nudibranch and shrimp. 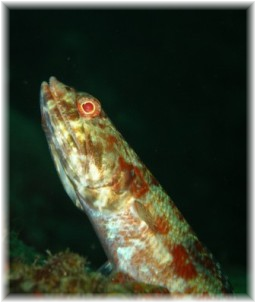 The diving conditions in Anilao are ideal for divers of all experience levels. Water temperatures are consistently warm; in the range of 26-28C (summer) to 22-26C (winter). Some divers will prefer a 3mm, or thicker wetsuit during the colder months. The visibility is also consistently good, averaging 60ft in most locations. Water currents can vary from virtually non-existent to strong, although the surface conditions typically remain calm and flat. The local resorts offer an excellent standard of customer service. The local staff will usually handle set-up and transport of your equipment to and from the boat. The local diving boats are called bangkas and typically hold 8-12 divers. They, are small outrigger-style boats that allow for a personalized diving experience and provide great stability in the water. A good option for those who suffer from seasickness! The price of diving in Anilao is much cheaper than other tourist-focused and commercialized areas in the Philippines. These can be, however, off-set by more expensive resort and transport costs. Some resorts even offer unlimited free shore diving with accommodation deals. 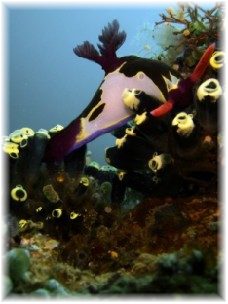 Anilao has a number of excellent beginner dive sites along the shore in front of the resorts. This makes it a perfect destination for PADI Open Water and Advanced Open Water courses. It also has some incredibly deep wall dives, again accessible from shore, which provide excellent training opportunities for technical divers. A vibrant marine sanctuary with coral heads scattered across sand slopes. It has sandy slopes, drop-offs, caves and over-hangs. 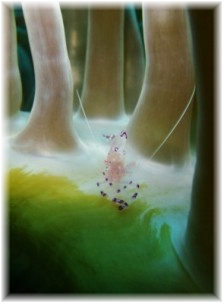 The diversity of marine life make it perfect for macro-photography and visibility is usually exceptionally good. There is an interesting cave on the east side of the island and an undersea pinnacle on the west. 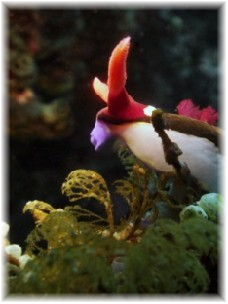 A fine variety of reef fish, corals and macro marine life. Some white-tip reef sharks often shelter in a cave on the headland. A vibrant and colorful site; corals, barrel sponges and crinoids are plentiful. This marine park sanctuary has beautiful corals that explode with a myriad of different fish species. 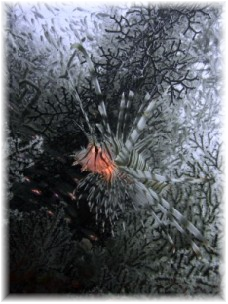 Many feather stars and soft corals. Large rock formations form the back-drop to this site, with multiple drop-offs from the surface down to 30m. Vibrant corals (both hard and soft) with schooling fish and lots of macro to find. A restful coral garden with a wide variety of marine life. It is perfect for novice divers. 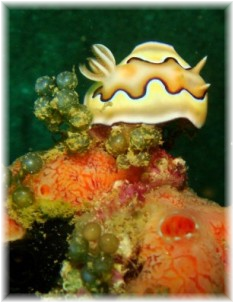 This spectacular marine life dive site is for experienced divers only, as currents are strong. Located close to Mainit Point, this shallow bay is a mecca for macro/muck diving aficionados. Little current, you can spend very long dives in the shallows (<10m) inspecting the volcanic sand for mimic octopus, frogfish and ghost pipefish. 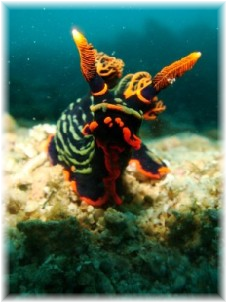 Many rate this site on a (near) par with locations like Lembeh (Indonesia). 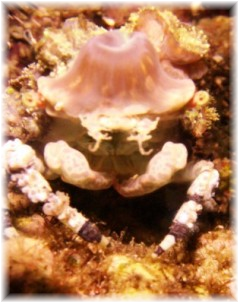 Anilao is primarily a resort and diving destination. The beaches tend to be rocky, but the resorts offer a number of other services to keep the non-divers in the travel party occupied. Spas, massage treatments, etc. are common offerings. Snorkeling right next to the resorts is also very popular and easily accessible. Northeast of Anilao is Lake Taal, containing the world’s smallest volcano. Another popular weekend destination for Manila residents, this unique volcano sits in the middle of the lake, with another lake inside the crater of the volcano! Hikes are available up the slope of the volcano, with a lot of tourist attractions around the outside of the lake (resorts, golf courses, etc.). Most resort and dive centers based in Anilao will be pleased to book you a private car and diver for your journey to/from Manila. Typical costs are 4300php (~$100USD) each way. This is inevitably the easiest and most relaxing way to reach your destination, but at a cost. The journey should take 2-3 hours, mostly depending on the Manila traffic. You may opt to negotiate transport from your Manila hotel via a regular taxi. The prices are typically the same as arranging a private car via the resort (and can be more expensive!). Use a regular taxi to get from the airport/your hotel to the Tritan bus station station at Buendia (Sen Gil. Puyat) Street (corner of Taft Avenue). Purchase ticket for the bus or shuttle van to Lemery, Batangas. The shuttle van is better, as it is an express route (less/no stops). Bus to Lemery (2-5 hours) /Shuttle Van (~2 hours). Ride the bus/van to the last stop (Lemery Town Proper). From there grab a Trike to your resort (prices negotiable, depending on distance). It’s best to contact your preferred resort directly in advance of travel, to confirm the best options for public transport. Some resorts are nearer to Batangas Town/Port and that should be your bus destination.